Sahara is a fresh release from Novomatic and it takes a new view of Egyptian slots! This is a very, very common theme for slot games. Novomatic and many other developers make Egyptian slot games. Some of Novomatic’s most high-profile Egyptian slots are: Book of Ra Deluxe, Sphinx Mysteries, Queen Cleopatra, Ramses 2, Pharaohs Ring, Anubix and Cleopatra Last of the Pharaohs. Sahara has a completely different look and feel to it than all of the others. This slot feels distinctly less cartoonish and altogether more classy. The symbols and the background look more like photos than cartoon designs. The backdrop to the reels is the side of a temple. On it, you can see beautiful and intricate carvings, showing pictures and hieroglyphics. There are some golden coins and other ancient relics balancing on top of the reels. The Sahara Desert now lies where ancient Egypt once flourished. Along the lush banks of the river Nile, one of history’s most iconic civilisations developed and thrived for thousands of years! The ancient Egyptians are particularly remembered for their religion and death rituals. Their gods are household names and their pyramids are famous all over the world! In Sahara, you get a taste of this culture – and not in a cartoon way! This slot really does feel Egyptian. There are 5 reels and 5 paylines in Novomatic’s Sahara. Many creatures and plants make the Saharan desert their home, a few species of fox and gazelle. You can also find the Saharan cheetah, many lizards and snakes. Date palms, grasses and acacia trees are also found in the desert. However, this Novomatic casino slot is all about when the Egyptians lived there! That’s why all of the symbols in this game are inspired by Egyptian culture. Pharaohs were Egyptian royalty, and only royal cards have made their way onto these reels. The Jack, Queen, King and Ace are symbols. There’s also a scarab beetle symbol and a symbol that shows two canopic jars. When ancient Egyptians used to perform mummification, they would remove the dead person’s organs and put them in canopic jars, which they would bury with them. Nefertiti is the symbol with the biggest payouts in Sahara. She’s posing like a model in this slot! She awards the biggest payouts by a massive margin. The last symbol in Sahar is a sphinx. An Egyptian sphinx has the head of a man and the body of a lion. The one in Sahara looks a lot like the Great Sphinx of Giza, which is the biggest and most recognisable of all! 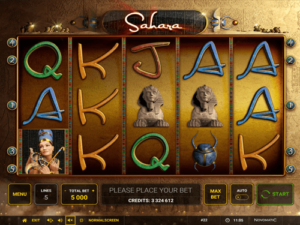 Sahara is a very standard sort of Novomatic casino slot game. When the reels stop, you want as many matching symbols to show as possible! Wins are only awarded for symbols that match and land consecutively on paylines. There are only 5 paylines in Sahara, which means the matching symbols only have 5 ways to land that will pay you money! Click the question mark symbol to see Sahara’s paytable. Flick through the pages to view the potential wins and the paths the paylines take. The paylines all go from left to right, which is how the matching symbols must land. The payouts are awarded when the required number of matching symbols land in winning positions. For the Jack symbol payouts, the minimum number of matches you need is two. For the other symbol payouts, the minimum number of matches you need is three. The sphinx Scatter symbol also requires three matches minimum for a payout. The Scatter is also the only symbol that can pay without landing on a payline. It can be scattered anywhere on the reels and still pay! Sahara doesn’t have a Wild symbol, not does it award Free Games. For beginner slot players, Sahara would definitely be a top choice!